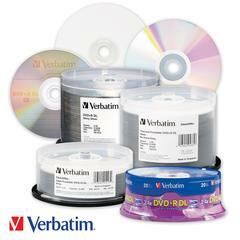 MediaSupply.com now offers FREE SHIPPING on all Verbatim DVDs & CDs for shipments to the Continental US! Dual Layer media has been a somewhat confusing issue in that many of the products available today just don't work very well. We have found that Verbatim DL products have been easily the most reliable. While they cost a bit more than most others, they have been the only product that works reliably in copiers, printers and automation equipment. Dual Layer disks are DVD’s that have multiple layers, providing users with 8.5GB of recording space (as opposed to 4.7GB of space) on a standard DVD Recordable discs). As the name suggests, dual layer technology provides two individual recordable layers on a single sided DVD disc. To take advantage of dual layer technology when recording DVDs, you must use a dual layer enabled DVD burner and dual layer DVD media. Dual layer technology media can be read (once recorded) by most DVD drives and players currently on the market. Dual Layer DVDs are compatible with standard DVD players, even in most older players. The Dual Layer aspect has been part of the DVD+R standard since the beginning, so there is very little in the way of compatibility issues. DVD+R Dual Layer can record up to four hours of high quality MPEG-2 video on a single disc. The main benefit of the additional space is the ability to increase the bit rate of the video when recording to get higher quality on the finished disc. Typical home DVD recorders use variable bit rate encoding to maximize DVD disc space. DL Recording also makes it possible for a consumer to create longer home movies and even consolidated many home movie projects onto a single disc. For making training or marketing videos, just like consumer applications, higher bit rate encoding of the video translates into better quality video for the viewer. Independent filmmakers can now fine tune their works on cost effective dual layer DVD recordable discs before creating the master for replication. Business users can save on sending out one disc, or fewer discs, when distributing large amounts of data. IT managers can can create system “images”, or "ghost" images, for configuring PCs on a single disc for rapid setup of new computers on corporate networks.